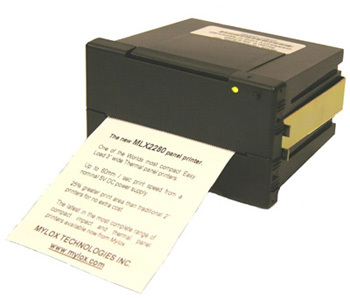 80mm (3 inch) wide paper version of panel mounted printer using the same, industry standard cutout dimensions as the 60mm (2 inch) model. This means easy upgrade from MLX-2260 or many other popular 57mm panel printers from other manufacturers. The extra paper width and higher number of dots per line lends itself to graphical applications, especially; medical equipment, data logging and fault recording.